Mapping out the research sources around our lecture recording programme: Classifying what we have in terms of attitudes, behaviour and knowledge; what we have that’s qualitative and what’s quantitative; and what we have that tells us about staff or students, has thrown up all sort of rich ideas for new research. There is a job of work to do to synthesise this information to create some baselines for future research and to help us quantify change over time. Some great ideas for case studies also fell out of the conversation. The exciting thing about this project is that it’s now starting to throw into sharp relief the big questions about teaching, technology and values. This is where the real potential lies. I’m loving the opportunity to work with Dr Jill MacKay on all of this – kudos to her for bringing the real research rigour to what we’re doing. 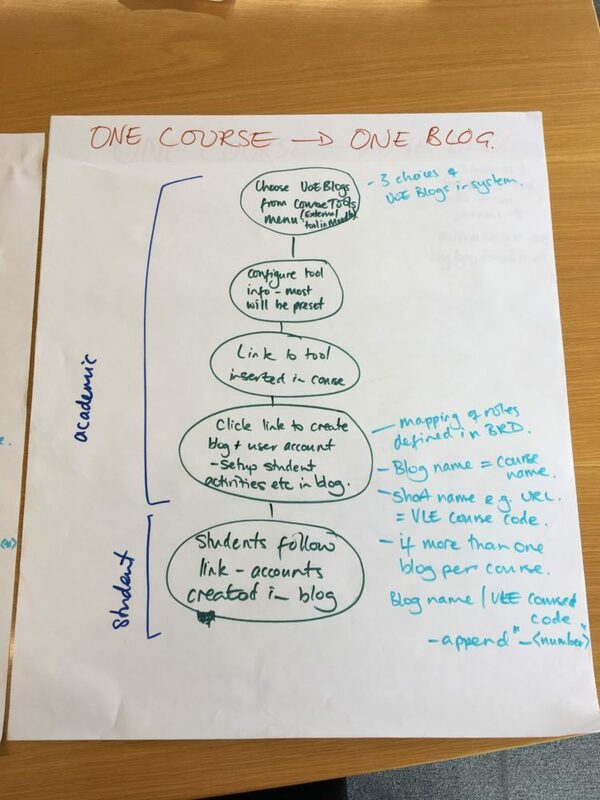 Sketching out the workflows for LTI integration between VLE courses and our new WordPress blogging service. This follows on from things I’ve blogged about already and is the final pre-cursor to putting down some code. We know better now what the LTI plugin we are going to develop needs to do, and even have some loose ideas for how it could be extended in the future to pass through custom parameters to choose templates. Really lovely to get to spend some quality time thrashing out the nerdy detail with Richard and Mark in my team. I don’t get as much time to do this kind of hands on stuff as I used to, so it’s a rare treat. Designed the bare bones of 4 workshops we need to develop to support the roll out of our blogging service. These will be developed in partnership with our University website team and we’ll get them advertised as part of our Digital Skills programme. One of the great things about this project is that I haven’t just got buy in to having a proper WordPress service to support learning and teaching activity (yay! at last! 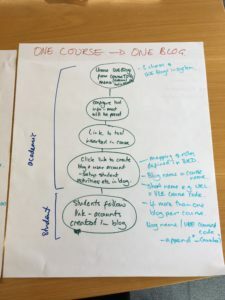 ); through hanging out with my web colleagues and inputting to the new University web strategy I’ve got blogs and domain of one’s own in there as part of our thinking about how we embrace the web more generally. Obviously we still have to produce the goods, but I’ll be working with Lorna and Stratos on this amongst many other good people. That there Tim Fawns has also given me some great feedback about the kinds of academic development we need to be providing. Running another Girl Geeks Scotland consultation event. I’m part of an interim leadership team who are taking this organisation through a consultation exercise in order to turn it into a stand-alone charity in it’s own right. The digital and tech sector in Scotland has seen massive changes in the 10 years that Girl Geeks Scotland has existed. Our challenge is to understand what we’ve done that’s been valued, and that isn’t being covered elsewhere; and for the things where we may be overlapping with other organisations now, how to move towards more partnership working. I’m lucky to be working with Sam, Gail and Morna on this. Jupyter notebooks pilot service: We’ve got a few technical things still to thrash out, but this project is throwing up a more general conversation about what we need to do in terms of learning technology provision to support computational teaching. Our three big interdisciplinary centres (Bayes, Usher, Edinburgh Futures Institute) are going throw up more requirements around both research and learning and teaching infrastructures in the next few years. James in my team who’s running with this project has come up with a great proposal for a symposium later in the year to get more of this conversation going. I had an office of my own for a couple of years and I hated it. I do my best work with other people around me and when working as part of a team. This week is another reminder of that.